Well, today was our last work day here in Piura. In the morning we all went to Mass at the school. It was a Solemn High Mass, and was very beautiful. After lunch, we were all given our afternoon work assignments. Most of the girls wanted to go to the Parish’s clinic because we heard that today they would be doing ultrasounds and listening to unborn children’s heartbeats. However, only eight of us were allowed to go, so Mr. Fitzpatrick drew names out of a hat. Other people went to Vacation Bible School, and still more went to celebrate Mass at three different village chapels. I was assigned to distribute food, and travelled in the back of an open truck down dusty roads to the village homes. The food bundles included basic foods such as rice, beans, canned milk, cooking oil etc. They were all so grateful, ad kept giving us hugs and showing us around their homes. One man told us, with tears in his eyes, that since his wife died a few years ago, the parish’s monthly food donation was all that was keeping him alive. Yesterday was full of celebration, as it was Father Lillard’s birthday. At lunch, he was surprised with confetti and shaving cream, which we sprayed in the air. Apparently it’s a Peruvian custom to spray shaving cream everywhere during a birthday! In the afternoon we traveled in separate groups to go to different Masses. 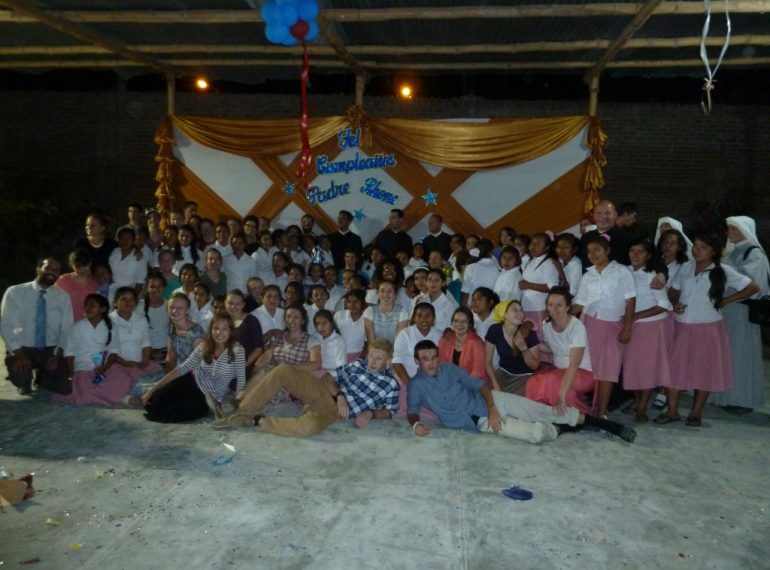 Then we all met at the Hogar for a second birthday celebration, which was quite the fiesta! The girls at the Hogar dressed up in traditional Peruvian clothing and performed beautiful dances for all of us. Then many of us got up to dance and eat cake, with more confetti and shaving cream sprayed into the air. Leaving the Hogar was very emotional for everyone (especially the females!). Many of us had become attached to certain little girls who clung to us from day one. Saying good-bye was very difficult, and lots of tears were shed by both us and our Peruvian chicas. I learned how to say “I will miss you” in Spanish, just for my little Peruvian friend, whose name is Rosemary. We will indeed miss the Hogar girls tremendously. Until next year! I think this trip has been a life-changing experience for all of us. You cannot truly know the suffering and hardships these people go through until you see it first hand. Despite their hardships, the greatest thing that has moved me is the love that these people have to give. They have so little, and yet when you look at them, the smiles on their faces radiate love. Tomorrow we will be packing up our things and touring a little bit of Piura. The next morning we will fly out to Lima, where we will be visiting the shrines of a few different saints and doing some sightseeing. So until the next journel post – adios amigos! God bless!